Star Trek Enterprise vs. Star Wars Millennium Falcon: Which Ship is Fastest? Enterprise vs. Millennium Falcon: Which is the Fastest? A highly speculative search for the fastest ship in science fiction. Set a Course! Select a destination below and see how long it would take some of the most famous ships from science fiction to travel there. Click again to skip race. Click again to restart race. To avoid total boredom, time is vastly accelerated, and slower ships have a handicap bonus. Interactive by Chris Kirk. Art by Andrew Morgan and Natalie Matthews. Star Trek is all about interstellar travel. It’s right there in the title. “Warp 6!” or “Warp 9!” captains bark, sometimes following with a pedantic “point four” and punctuating with a “do it!” or “punch it!” or “engage!” The numbers give the impression of a well-defined system of speed, but that’s misleading, and in this regard Star Trek is a good example of a recurring theme in popular science fiction: the obfuscation of distance and speed. When characters need to get from Point A to Point B with a speed that seems to defy existing rules, science fiction invents wormholes or slipstreams or other anomalies or allows captains to “risk” the ship by pushing it to a speed at which “she can’t take much more of this!” Or, worse, writers simply ignore the rules and leave it to fans, struggling to make sci-fi as real as possible, to explain away the inconsistencies for themselves in so many forums and wiki discussion pages. It’s a little odd that a genre about science, the field of precision, can be so imprecise. The truth is that spaceships almost always fly at the speed of the plot. But, for those who refuse to accept that, this is a definitive guide to ship speeds, based on highly scientific computer simulations and highly unscientific speculation. Enterprise: Nerds at Memory Alpha, the Star Trek wiki, have already arrived at a sprawling explanation that employs multiple warp scales associated with different eras of Star Trek’s fictitious history. The short version: As determined by a writers’ guide for the original series, the Enterprise of the original series, going at maximum, slightly unsafe warp, can reach Alpha Centauri in about three days. Although this conflicts with the apparently short trip the ship takes from Earth to Vulcan in Star Trek (2009), we’ll defer to the original series on this one. Later ships are faster, but even Voyager, one of the fastest Federation ships in the Star Trek universe, expected to take several decades to cross the galaxy and return home. Millennium Falcon: When Luke and Obi Wan first meet Han Solo in Mos Eisely, the first thing the smuggler does is brag about his ship. “You’ve never heard of the Millennium Falcon?” Han asks. That’s when A New Hope makes its infamous technical blunder. “It’s the ship that made the Kessel Run in less than 12 parsecs,” Han says. A parsec is, of course, a unit of distance, not time. Unfortunately, even the elaborate explanation of later material offers no more clues about the Millennium Falcon’s actual speed than the original flub. “She’ll make point five past light speed,” Han will later brag, but what does that mean? It certainly doesn’t mean 1.5 times the speed of light speed, because it would still take the ship several years to move between stars. 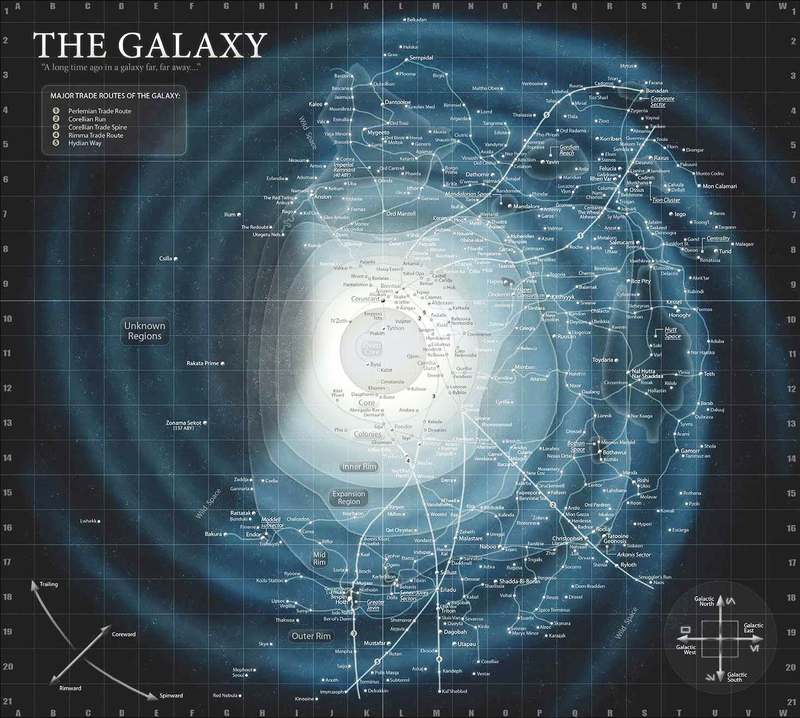 The Skywalker gang travels from Tatooine to where Alderaan is supposed to be in a matter of hours at the most, and the two planets, if this star chart is to be believed, are half a galaxy apart—though that wouldn’t jibe with a Star Wars role-playing book that suggests it would take several months to cross the galaxy. Crossover comics notwithstanding, the characters never make voyages to other galaxies, though this is apparently due to a disturbance at the edge of the galaxy. And a question I posed to the Star Wars subreddit yielded mixed answers. Here’s my conclusion: In the films, the characters travel among Tatooine, Alderaan, Yavin, Hoth, Dagobah, Bespin, Naboo, Coruscant, Mustafar, and Geonosis, and never does it seem as if months or even weeks have passed. Every time a Star Wars character travels, it appears no more than the Star Wars equivalent of a short road trip, so we’ll conclude, assuming Han can get the hyperspace engine working, that the Millennium Falcon could reach the galactic center in mere minutes. TARDIS: “All of time and space; everywhere and anywhere; every star that ever was,” the Eleventh Doctor says in a trailer for Series 5. In the 797 episodes of all the series, the TARDIS is seen at times instantly rematerializing in new galaxies or universes or times, usually accompanied with its signature noise. At others, it hurtles through space or chases down cars. We’re going to stick with its fastest mode of travel and assume it can travel to any place and any time, virtually instantaneously. Planet Express Ship: The Planet Express Ship’s dark matter drive, which pulls the universe around it at 200 percent fuel efficiency, allows it to routinely make trips to other galaxies, such as the Galaxy of Terror, as well as, on one “morning off,” the edge of the universe. Its regular intergalactic flights make it easily one of the speediest ships in science fiction. Jupiter 2: The ship of the lost Robinson family was to reach Alpha Centauri in 5.5 years, according to the aired pilot. Serenity: Travel in the Verse is strictly interplanetary. A production manual suggested Malcolm Reynolds’ Firefly-class ship takes 16 days to travel one astronomical unit, or the distance between the Earth and the sun, although whether this is canonical is debatable. Material tied to the Serenity Role Playing Game suggests the planets of the Verse are arrayed among four very close stars that span, if this “Complete and Official Map of the Verse” is to be believed, a couple of hundred AU. Even with Wash at the helm, Kaylee in the engine room, and Malcolm spouting Chinese curses the whole way, Serenity would need a few decades to travel to another star system. Battlestar Galactica: Galactica travels through space skipping from one location to another in instant jumps of a few light-years. The maximum range of each jump is obscure, but seems to be about 16 “Colonial light-years,” which I’m going to equate to light-years over the objections of possibly hundreds of nerds. The duration of the cool-down period is similarly elusive, but it’s “brief,” so let’s say five minutes. That’s about 4,600 light-years in a day, which means, excluding any structural damage to the ship, Galactica can travel to center of the galaxy in about six days doing one jump after another, with Cylons on their heels the whole way. Voyager 1: The real-world space probe, launched in 1977, is traveling away from the sun at 38,600 miles per hour. That’s about 0.00005 light-years per year. If the probe were heading in the direction of Alpha Centauri, it would take several thousand years to arrive.